Take one second and add this website to your bookmarks . 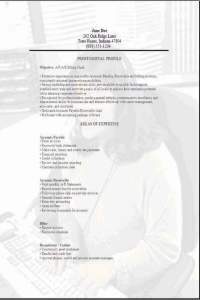 You will want to let your many friends know where you got your formatted accountant clerk resume totally free. This is one of my favorite resume formats I created for use myself. The formatted look is what's great. Doesn't it look very professional? Also the design is simplified. I think it makes the information more pronounced, as we sure do not want the interviewer to have a hard time searching for information . When they first review your resume, we want our qualifications to just pop off the page, no searching because it will be very visible with just a glance. Once you have edited this resume by replacing the information with your current job history, you will have accomplished what this website is all about. Getting your resume completed. I hope that you do find this resume very useful. I wish you good luck landing the job. Please recommend to your friends this free website, and feel free to comment about the accountant clerk resume picture on our contact us page. The accounting resume above is a great addition to your arsenal, I also hope you like the effect on number 3. Some people love background effects, I know that I am one of those people. If you wish to download the accounting resume with the background effect, then write a comment about it using the contact us page. Your comments are always welcome. 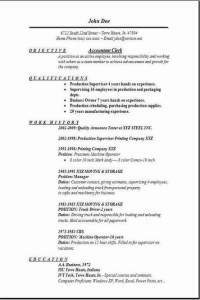 You could also use the free blank resume template on this website to help organize your accountant resume in different formats. There, you can go ahead and create 3 accountant resume templates that you can evaluate after you edit them with your own information. I know creating your accountant resume is a difficult task, so utilize the resources on this site, and you will get the job done in a timely fashion. They will look great after you are done with them.